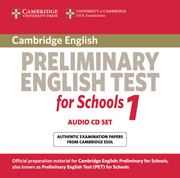 Four authentic practice tests for the Cambridge English: Preliminary (PET) exam from Cambridge English Language Assessment. 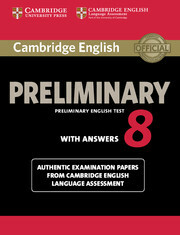 These examination papers for the Cambridge English: Preliminary (PET) exam provide the most authentic exam preparation available, allowing candidates to familiarise themselves with the content and format of the exam and to practise useful exam techniques. The Student's Book with answers is perfect for classroom-based test practice. An Audio CD containing the recordings for the Listening test is available separately, or as part of the self-study edition (containing the Student's Book with answers and Audio CD), also available separately. Set of four authentic PET for Schools examination papers from Cambridge ESOL.